It is the goal of every single business to be successful and make money. Part of determining how much money you are actually making, is to find out how much you are spending. Energy usage can become a major expense to a business owner, and using this Energy Usage Calculator can be very enlightening. This will allow you to start seeing where your profit is really going. Awareness of energy usage can bring about some changes that can help you to use energy more wisely. This will often affect the bottom line for a business to help them become a more profitable setting. This Energy Usage Calculator will allow you to track all of the electronics, appliances and any other items that use energy to have a record of where your money is actually going each month. It is easy to list all of the items in your office, and this is something that can be done quickly with little disruption to your day. Once you have an idea of your energy consumption, you can begin to look for ways to reduce your use. This can allow your office to have a greener goal in mind. Make sure that you are including all of the items in your office that use energy. You will simply download the calculator for free and begin using right away. Change the list frequently as you add new items. This can also show you how using energy saving equipment can affect your bottom line. Make sure you are using a backup system on your computer to save your information just like you would protect other important documents in your business. 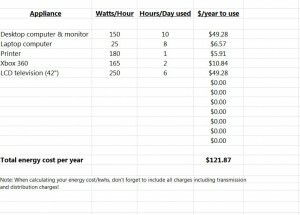 Applying the Energy Usage Calculator to your business can be very enlightening. This will often prompt a business owner to begin really looking at ways to increase profits, and this can affect the future of any type of business setting.